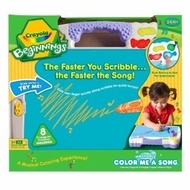 Foster your toddler's creative confidence with Crayola Beginnings Color Me A Song. As your child scribbles, the unit generates colorful music. 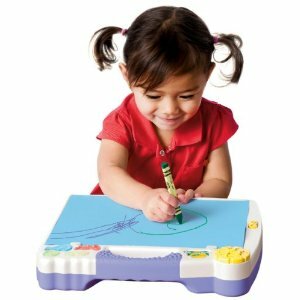 The faster your child scribbles, the faster the music plays. Creative music experience helps develop gross and fine motor skills. Four instrument buttons let your child choose piano, banjo, trumpet and drum music in four different musical styles: country, rock, salsa and swing. The Color Me A Song unit contains built-in storage for eight triangular crayons.